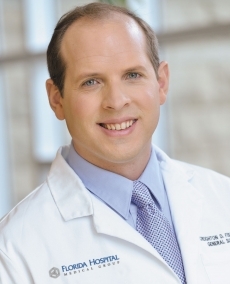 Creighton Fiscina, MD, is a board-certified general surgeon with advanced skills in minimally invasive, robotic-assisted and single-incision surgical techniques. He has performed thousands of surgeries to address conditions ranging from acid reflux to breast and skin cancers, biliary disease, gallstones, hernias and gastrointestinal issues, as well as thyroid, parathyroid and spleen disorders. His outstanding dedication to his community has been recognized with the Caring Heart Award, and his original research has been published in multiple scientific journals and presented at prestigious medical forums. Dr. Fiscina is also an active member of the Society of Gastrointestinal and Endoscopic Surgeons (SAGES). Laparoscopic and robotic minimally invasive surgeon specializing in multiple hernia repairs, small and large bowel resections, and gastroesophageal reflux disease. My care philosophy is always to take time with patients and their family members when explaining the plan of care, and treat all patients as if they were my own family members. Note:- The list below is for reference purposes only and is subject to change. Please check with your health plan to confirm that Creighton Fiscina, MD is included before scheduling an appointment.